"Tereshkova" redirects here. For the Kazakh sprinter, see Olga Tereshkova. For the lunar crater, see Tereshkova (crater). This name uses Eastern Slavic naming customs; the patronymic is Vladimirovna and the family name is Tereshkova. Valentina Vladimirovna Tereshkova (Russian: Валенти́на Влади́мировна Терешко́ва, IPA: [vɐlʲɪnʲˈtʲinə vlɐˈdʲimʲɪrəvnə tʲɪrʲɪʂˈkovə] ( listen); born 6 March 1937) is a retired Soviet cosmonaut, engineer, and current member of the Russian State Duma. She is the first woman to have flown in space with a solo mission on the Vostok 6 on 16 June 1963. Tereshkova also became the first civilian to fly in space as she was only honorarily inducted into the Soviet Air Force in order to join the Cosmonaut Corps. Before her recruitment as a cosmonaut, Tereshkova was a textile-factory assembly worker and an amateur skydiver. After the dissolution of the first group of female cosmonauts in 1969, she became a prominent member of the Communist Party of the Soviet Union, holding various political offices. She remained politically active following the collapse of the Soviet Union and is regarded as a hero in post-Soviet Russia and much of the world. Having orbited Earth 48 times, Tereshkova remains the only woman to have been on a solo space mission. Valentina Tereshkova was born on 6 March 1937 in the Bolshoye Maslennikovo, a village on the Volga River 270 kilometres (170 mi) northeast of Moscow and part of the Yaroslavl Oblast in central Russia. Her parents had migrated from Belarus. Tereshkova's father was a former tractor driver and a sergeant in the Soviet Army. He died during the Winter War when Tereshkova was two years old. Her mother who had three children and worked in the Krasny Perekop cotton mill. Tereshkova was first enrolled in school at age 10; however, she left school in 1953 at 16 and continued her education by correspondence courses to graduate from the Light Industry Technical School. She became interested in parachuting from a young age, and trained in skydiving at the local Aeroclub, making her first jump at age 22 on 21 May 1959. At the time, she was employed as a textile worker in a local factory while training as a competitive parachutist, which she kept a secret from her family. Her expertise in skydiving led to her selection as a cosmonaut. In 1961, she became Secretary of the local Komsomol (Young Communist League) and later joined the Communist Party of the Soviet Union. After the flight of Yuri Gagarin in 1961, Sergey Korolyov, the chief Soviet rocket engineer, envisioned the idea of putting a woman in space. On 16 February 1962, Valentina Tereshkova was selected to join the female cosmonaut corps. Out of more than 400 applicants, five were selected: Tatyana Kuznetsova, Irina Solovyova, Zhanna Yorkina, Valentina Ponomaryova, and Tereshkova. Qualifications included being parachutists under 30 years of age, under 170 cm (5 ft 7 in) in height, and under 70 kg (154 lb) in weight. 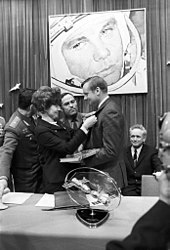 Tereshkova was considered a particularly worthy candidate, partly due to her "proletarian" background, and because her father, tank leader sergeant Vladimir Tereshkov, was a war hero. He died in the Finnish Winter War during World War II in the Lemetti area in Finnish Karelia when Tereshkova was two years old. After her mission, she was asked how the Soviet Union should thank her for her service to the country. Tereshkova asked that the government search for and publish the location where her father was killed in action. This was done, and a monument now stands at the site in Lemetti—now on the Russian side of the border. Tereshkova has since visited Finland several times. Training included weightless flights, isolation tests, centrifuge tests, rocket theory, spacecraft engineering, 120 parachute jumps, and pilot training in MiG-15UTI jet fighters. The group spent several months in intensive training concluding with examinations in November 1962, after which four remaining candidates were commissioned Junior Lieutenants in the Soviet Air Force. Tereshkova, Solovyova, and Ponomaryova were the leading candidates, and a joint mission profile was developed that would see two women launched into space, on solo Vostok flights on consecutive days in March or April 1963. Originally it was intended that Tereshkova would launch first in Vostok 5 while Ponomaryova would follow her into orbit in Vostok 6. However, this flight plan was altered in March 1963. Vostok 5 would now carry a male cosmonaut Valery Bykovsky flying the joint mission, with a solo woman aboard Vostok 6 in June 1963. 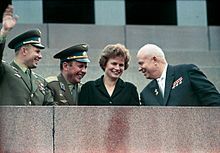 The State Space Commission nominated Tereshkova to pilot Vostok 6 at their meeting on 21 May and this was confirmed by Nikita Khrushchev himself. Tereshkova was exactly ten years younger than the youngest Mercury Seven astronaut, Gordon Cooper. After the successful launch of Vostok 5 on 14 June, Tereshkova began final preparations for her own flight. She was 26 at the time. On the morning of 16 June 1963, Tereshkova and her backup Solovyova were both dressed in spacesuits and taken to the launch pad by bus. Following the tradition set by Gagarin, Tereshkova also urinated on the bus tire, becoming the first woman to do so. After completing her communication and life support checks, she was sealed inside the Vostok. After a two-hour countdown, Vostok 6 launched faultlessly, and Tereshkova became the first woman in space. Her call sign in this flight was Chaika (English: Seagull; Russian: Ча́йка), later commemorated as the name of an asteroid, 1671 Chaika. Although Tereshkova experienced nausea and physical discomfort for much of the flight, she orbited the earth 48 times and spent almost three days in space. With a single flight, she logged more flight time than the combined times of all American astronauts who had flown before that date. Tereshkova also maintained a flight log and took photographs of the horizon, which were later used to identify aerosol layers within the atmosphere. Vostok 6 was the final Vostok flight and was launched two days after Vostok 5 which carried Valery Bykovsky into a similar orbit for five days, landing three hours after Tereshkova. The two vessels spent three days in adjacent orbits and, at one point, approached each other to within 5 km (3.1 mi). Tereshkova was able to communicated with Bykovsky via radio. Even though there were plans for further flights by women, it took 19 years until the second woman, Svetlana Savitskaya, flew into space. None of the other four in Tereshkova's early group flew, and in October 1969, the pioneering female cosmonaut group was dissolved. In September 1963, Tereshkova donated a silver cup at the women's 1963 European Rowing Championships held in Khimki near Moscow for the most successful nation, which went to the team from the Soviet Union as they won gold in all five boat classes. After her flight, Tereshkova studied at the Zhukovsky Air Force Academy and graduated with distinction as a cosmonaut engineer. In 1977 she earned a doctorate in engineering. Due to her prominence, Tereshkova was chosen for several political positions: from 1966 to 1974 a member of the Supreme Soviet of the Soviet Union, from 1974 to 1989 a member of the Presidium of the Supreme Soviet, and from 1969 to 1991 a member of the Central Committee of the Communist Party. In 1997, she retired from the Russian Air Force and the cosmonaut corps by presidential order. She was a major general in the air force. Beyond her recognized political offices within the Soviet Union, Tereshkova also became a well-known representative of the Soviet Union abroad. She became a member of the World Peace Council in 1966 and a member of the Yaroslavl Soviet in 1967. She was also the Soviet representative to the UN Conference for the International Women's Year in Mexico City in 1975. She also led the Soviet delegation to the World Conference on Women in Copenhagen and played a critical role in shaping the socialist women's global agenda for peace. She attained the rank of deputy to the Supreme Soviet, membership of the Communist Party of the Soviet Union Central Committee, Vice President of the International Woman’s Democratic Federation and President of the Soviet-Algerian Friendship Society. She was decorated with the Hero of the Soviet Union medal, the USSR's highest award. She was also awarded the Order of Lenin, Order of the October Revolution, numerous other medals, and foreign orders including the Karl Marx Order, United Nations Gold Medal of Peace, and the Simba International Women’s Movement Award. She was also bestowed a title of the Hero of Socialist Labor of Czechoslovakia, Hero of Labor of Vietnam, and Hero of Mongolia. In 1990 she received an honorary doctorate from the University of Edinburgh. Tereshkova was among a group of the first living people to have a lunar crater named after them (Tereshkova crater on the far side of the Moon). After the collapse of the Soviet Union, Tereshkova lost her political office but none of her prestige. She is still revered as a hero, and to some her importance in Russian space history is only surpassed by Yuri Gagarin and Alexei Leonov. She was elected to the State Duma, the lower house of the Russian legislature, in 2011 as a member of United Russia where she continues to serve. Tereshkova's life and spaceflight were first written of in the West in the 1975 book: It Is I, Sea Gull; Valentina Tereshkova, the first woman in space by Mitchel R. Sharpe and then again in greater detail of her life and spaceflight in the 2007 book Into That Silent Sea by Colin Burgess and Francis French, including interviews with Tereshkova and her colleagues. Tereshkova was invited to Prime Minister Vladimir Putin's residence in Novo-Ogaryovo for the celebration of her 70th birthday. While there she said that she would like to fly to Mars, even if it meant that it was a one-way trip. Tereshkova, together with Yelena Mizulina, Irina Yarovaya and Andrey Skoch, is a member of the inter-factional parliamentary group for the protection of Christian values; in this capacity, she supports the introduction of amendments to the Constitution of Russia, according to which "Orthodoxy is the basis of Russia's national and cultural identity". On 5 April 2008, she was a torchbearer of the 2008 Summer Olympics torch relay in Saint Petersburg, Russia. She received the Eduard Rhein Ring of Honor from the German Eduard Rhein Foundation in 2007. The wedding ceremony of pilot-cosmonauts Valentina Tereshkova and Andriyan Nikolayev, 3 November 1963. Tereshkova married cosmonaut Andriyan Nikolayev on 3 November 1963 at the Moscow Wedding Palace with Khrushchev presiding at the wedding party together with top government and space programme leaders. On 8 June 1964, nearly one year after her space flight, she gave birth to their daughter Elena Andrianovna Nikolaeva-Tereshkova, the first person with both a mother and father who had travelled into space. She and Nikolayev divorced in 1982. Her second husband, the orthopaedist Yuliy G. Shaposhnikov, died in 1999. Valentina Tereshkova among delegates at the 24th Congress of the CPSU, 1971. Monument in Bayevsky District of Altai Territory, Siberia, close to her landing place of 53°N, 80°E. In 1997, London-based electronic pop group Komputer released a song entitled "Valentina" which gives a more-or-less direct account of her career as a cosmonaut. It was released as a single and appears on their album The World of Tomorrow. The band Public Service Broadcasting also has a song entitled "Valentina" on their 2015 album The Race for Space in tribute to her. In the same year, Findlay Napier's album VIP: Very Interesting Persons included a song "Valentina", written in her honour by Napier and Boo Hewerdine. Tereshkova was featured in the 2003 made-for-television adaptation of A Wrinkle in Time. She was portrayed by Apollonia Vanova. In season three of Orange is the New Black, Red describes Tereshkova as her hero, and notes her focus in wanting to travel to Mars, despite being in her seventies. In 2015, a short film entitled Valentina's Dream was released by Meat Bingo Productions. The film stars Rebecca Front as Tereshkova and is based on an interview by the former cosmonaut where she expressed a desire to journey to Mars. The 2007 video game Mass Effect included a fictional star system named for Tereshkova. Streets in Ukraine that bore Tereshkova's name have been renamed due to the country's 2015 decommunization law. The 2015 space flight simulator Kerbal Space Program features a pilot Kerbal named Valentina in her honor. The 2017 mobile RPG Alliance: Heroes of the Spire has a hero named "Valentina, the Star Pioneer" in honor of Tereshkova. In 2017, Uruguayan electronic duo Corvis released a full album inspired by Valentina's courage, Krasnyy. They specially made her a tribute naming "Chaika" to the most climatic and emotional track of the album. The BBC drama Call the Midwife (Season 7, Episode 4; broadcast 11 February 2018) used the space flight of Tereshkova as an example of heroism by a woman. ^ "Valentina Vladimirovna Tereshkova". Yaroslavl Region. 2016. Archived from the original on 4 September 2015. Retrieved 3 April 2016. ^ "8 surprising facts about stellar career of Valentina Tereshkova, the 1st woman in space". RT. 6 March 2017. Archived from the original on 20 January 2018. Retrieved 19 January 2018. ^ Dejevsky, Mary (29 March 2017). "The first woman in space: 'People shouldn't waste money on wars'". The Guardian. Archived from the original on 20 January 2018. Retrieved 19 January 2018. ^ a b c d Evans, Ben (2 April 2010). Escaping the Bonds of Earth: The Fifties and the Sixties. Springer Science & Business Media. p. 52. ISBN 9780387790947. ^ a b c "Preface". The 'First Lady of Space': In Her Own Words. Middletown, Delaware: SpaceHistory101.com Press. 2015. p. 4–7. ISBN 9781887022996. Reprint of "The 'First Lady of Space' Remembers". Quest: The History of Spaceflight Quarterly. 10 (2). First printed in 2003. ^ "Першая жанчына‑касманаўт ў дзяцінстве гаварыла па‑беларуску" [The first woman in space spoke Belarusian as a child]. Nasha Niva (in Belarusian). 24 April 2009. Archived from the original on 17 June 2018. Retrieved 3 April 2016. ^ a b c Siegel, Ethan (6 March 2017). "The First Woman In Space Turns 80, And You Probably Never Heard Of Her". Forbes. Retrieved 16 March 2019. ^ "President Vladimir Putin of Russia Congratulates Valentina Tereshkova, First Woman In Space on 80th Birthday". YouTube.com. Russia Today. 6 March 2017. Archived from the original on 5 April 2017. Retrieved 7 March 2017. ^ Ghosh, Pallab (17 September 2015). "Valentina Tereshkova: USSR was 'worried' about women in space". BBC News. Retrieved 3 April 2016. ^ a b Sever, Megan (June 2014). "June 16, 1963 & June 18, 1983: Valentina Tereshkova and Sally Ride Become First and Third Women in Space". Earth. 59 (6): 60–61. Archived from the original on 14 April 2016. Retrieved 3 April 2016. ^ Burgis, Colin; Vis, Bert (2015). Interkosmos: The Eastern Bloc's Early Space Program. Springer Paxis Books. ISBN 978-3319241616. ^ "First Woman in Space ‹ HistoricWings.com :: A Magazine for Aviators, Pilots and Adventurers". fly.historicwings.com. Archived from the original on 9 September 2018. Retrieved 9 September 2018. ^ Knapton, Sarah (17 September 2015). "Russia forgot to send toothbrush with first woman in space". The Daily Telegraph. Archived from the original on 24 March 2016. Retrieved 3 April 2016. ^ Knight, Kelly (June 2003). "Earth calling Seagull". Astronomy. 31 (6): 30. ^ "Валентина Терешкова: чьей воле покорялась женщина, покорившая космос" [Valentina Tereshkova: the Woman who Conquered Space]. RIA Novosti (in Russian). 16 June 2006. Retrieved 3 April 2016. ^ Kennedy, Maev (17 September 2015). "First woman in space recalls mission's teething troubles". The Guardian. Archived from the original on 29 March 2016. Retrieved 3 April 2016. ^ Tereshkova, Valentina (4 January 1964). "Three days in outer space". The Saturday Evening Post. 237 (1): 62–63. ^ a b Harvey, Brian (2007). Soviet and Russian Lunar Exploration. Springer New York. p. 176. ISBN 9780387218960. ^ Ghodsee, Kristen (Winter 2012). 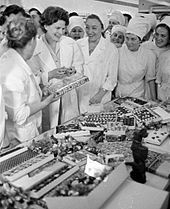 "Rethinking State Socialist Mass Women's Organizations: The Committee of the Bulgarian Women's Movement and the United Nations Decade for Women, 1975-1985". Journal of Women's History. 24 (4): 49–73. doi:10.1353/jowh.2012.0044. ^ Andersson, Leif E.; Whitaker, Ewen A. (October 1982). "NASA Catalogue of Lunar Nomenclature" (PDF). NASA. p. 68. RP-1097. ^ "500 Men Have Moon Craters Named for Them". Messenger-Inquirer. Owensboro, Kentucky. Associated Press. 22 August 1970. p. 2 – via Newspapers.com. ^ "Терешкова Валентина Владимировна" [Tereshkova, Valentina Vladimirovna]. The State Duma of the Federal Assembly of the Russian Federation. 2016. Archived from the original on 23 September 2015. Retrieved 3 April 2016. ^ Sharpe, Mitchell R. (1975). "It is I, Sea gull;": Valentina Tereshkova, first woman in space. Crowell. ISBN 978-0-690-00646-9. ^ "First woman in space dreams of flying to Mars". Reuters. 6 March 2007. Archived from the original on 2 March 2009. Retrieved 26 May 2008. ^ "First female astronaut Valentina Tereshkova wants one-way Mars ticket". News.com.au. 9 June 2013. Archived from the original on 16 April 2016. Retrieved 3 April 2016. ^ "Олимпийский огонь понесут Друзь, Фрейндлих и Плющенко". Komsomolskaya Pravda (in Russian). 16 October 2012. Archived from the original on 6 June 2013. Retrieved 4 March 2013. ^ "The Eduard Rhein Ring of Honor Recipients". Eduard Rhein Foundation. Archived from the original on 18 July 2011. Retrieved 5 February 2011. ^ "Ring of Honor 2007 – Dr. techn. Dr.h.c.mult. Valentina V. Tereschkova". Eduard Rhein Foundation (in German). Archived from the original on 18 July 2011. Retrieved 5 February 2011. ^ Eidelman, Tamara (2013). "A Cosmic Wedding". Russian Life. 56 (6): 22–25. ^ Feldman, Heather (2003). Valentina Tereshkova: The First Woman in Space. Rosen Publishing Group. ISBN 978-0-8239-6246-4. ^ Gibson, Karen (2014). Women in Space: 23 Stories of First Flights, Scientific Missions, and Gravity-Breaking Adventures. Chicago Review Press. p. 55. ISBN 9781613748473. ^ "The Japan News". the-japan-news.com. ^ "Rednauts Get Top Marx". Daily News. New York, New York. 22 October 1963. p. 210 – via Newspapers.com. ^ Rosen, Rebecca J. (16 June 2013). "The Remote Siberian Monument to the First Woman in Space, Who Launched 50 Years Ago Today". The Atlantic. Archived from the original on 2 March 2016. Retrieved 3 April 2016. ^ Cris Converse (3 March 2016). Mass Effect Game Guide. Booksmango. pp. 60–61. ISBN 978-1-63323-677-6. ^ "The scandal with the renaming in Odessa: the city Council gave the answer". z-news.link. Archived from the original on 12 April 2018. Retrieved 2 May 2017. ^ Kerbal Space Program [@KerbalSpaceP] (24 February 2015). "@xZise She's named after Valentina Tereshkova, the first woman in space" (Tweet) – via Twitter. Bill O’Neil, "Whatever became of Valentina Tereshkova?" New Scientist 8/14/93, Vol. 139, Issue 1886p. 21. A. Lothian, Valentina: The First Woman in Space, The Pentland Press, 1993, ISBN 978-1858210643. Tamara Eidelman, "The First Woman in Space," Russian Life. May/Jun 2008, Vol. 51, Issue 3, p. 19-21. Tamara Eidelman, "The Extraordinary Destiny of an ‘Ordinary’ Woman," Russian Life. May/June 2003, Vol. 46, Issue 3, p.19. Daniel Gauthier, "Valentina Vladimirovna Tereshkova." Ad Astra. Jul/Aug 1991, Vol. 3, Issue 6, p. 29. Robert Griswold, ""Russian Blonde in Space": Soviet Women in the American Imagination, 1950-1965." Journal of Social History. Summer 2012, Vol. 45, Issue 4, p.881-907. Laira Woodmansee, "Two who dared," Ad Astra. Summer 2005, Vol. 17, Issue 2, p. 48-48. Gibson, Karen Bush (2014). Women in space: 23 stories of first flights, scientific missions, and gravity-breaking adventures. Chicago: Chicago Review Press. ISBN 9781613748459. Wikimedia Commons has media related to Valentina Tereshkova. Wikimedia Commons has media related to Commons:RIA Novosti/Tereshkova.